For over fifty years, the Commonwealth's lock on wormhole transit has enabled the military government to keep its grip on commerce, travel, and the community in diaspora off Earth. But everything changed once Ro Maldonado resurrected the damaged AI on a derelict spaceship. When she and her accidental passengers aboard Halcyone stumbled upon a hidden planet and Ada May, its brilliant but reclusive leader, they became entangled with her covert resistance. But behind the scenes of the Commonwealth lurks an even bigger enemy: the Reaction Chamber, a powerful shadow organization of politicians, business moguls, and crime cartels that has co-opted and infiltrated all levels of the government. The Chamber knows Halcyone is the key to finding and eliminating the resistance. And as people close to Ro and her companions disappear or die, it's clear their enemies are closing in fast. When May vanishes through an impossible wormhole, taking the leader of the Reaction Chamber with her, she abruptly shatters a decades-old stalemate. Now Halcyone and her crew must decode May's revolutionary wormhole technology and locate the missing scientist before the Reaction Chamber obliterates the resistance and exploits its resources to seize complete control of the cosmos. 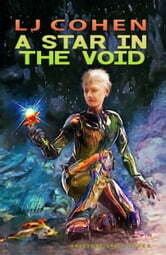 A Star in the Void is the fifth and final book of the Halcyone Space series that began with the award winning Derelict. Get it now at the special pre-order price of $2.99.